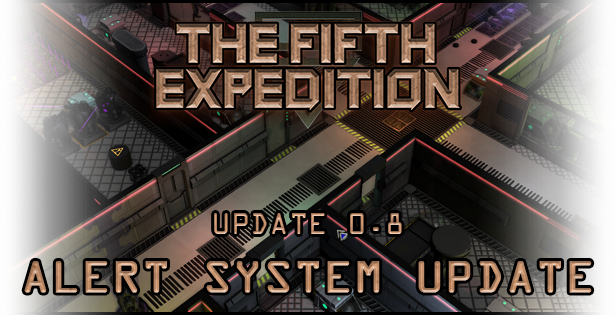 Here we are with the second content update for The Fifth Expedition. This time around we've done a lot of things under the hood. Most importantly, the alert system. The game now keeps track of the alert level within each map. Destroying parts of the security system or getting spotted by cameras will increase the alert level. If it goes to high, new enemies will emerge into the map and complicate matters. Also of note: an overhaul to the movement system that gives every character a bit more of an self preservation instinct. Characters will now try to avoid traps they can see and, unless ordered to be reckless, refuse to cross obviously harmful areas, asking for new orders instead. The system will be expanded in future updates to make the characters AI and pathfinding even smarter and including the perception attribute into things. Additionally, we added some quality of life abilities. One such is that characters who fall into holes will no longer automatically be killed, but try to grab onto the edge. If their strength attribute is high enough, they'll just pull themselves up. If not, another character can pull them up if they arrive in time. Also new: Once any enemy has been damaged by a character, you'll be able to hover over them to see their hitpoints. These are just some examples in a long list of small changes and fixes. For a full picture, take a look at our patch notes. We're hoping you'll enjoy the new additions while we work on the next batch of improvements and new content.